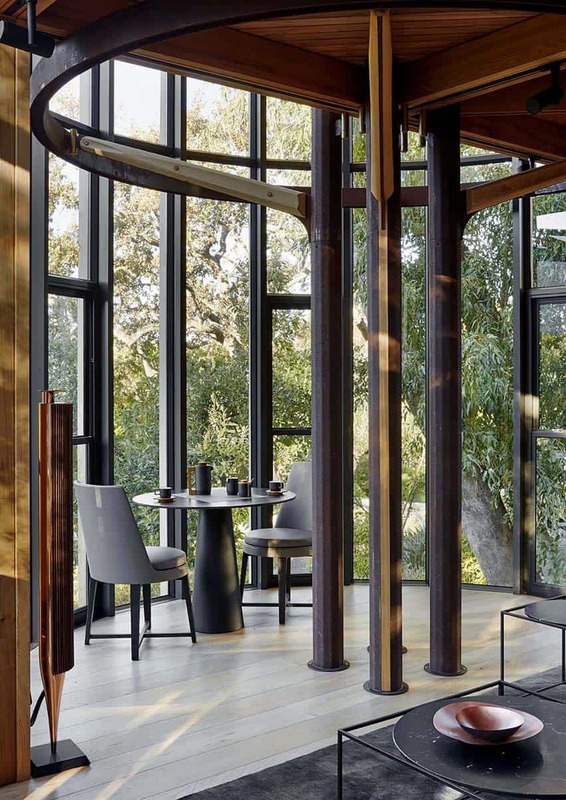 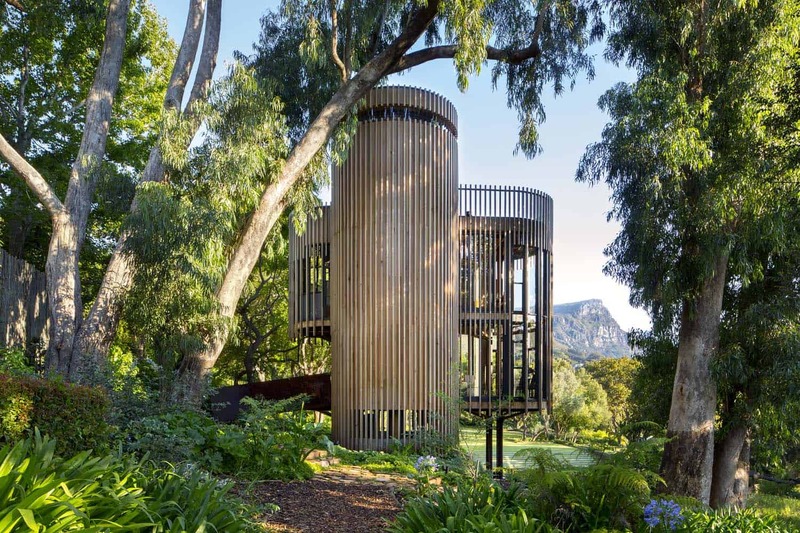 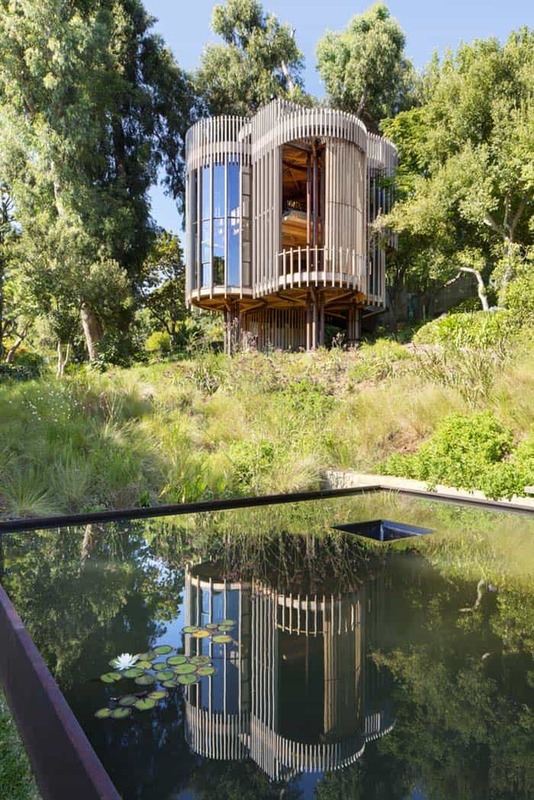 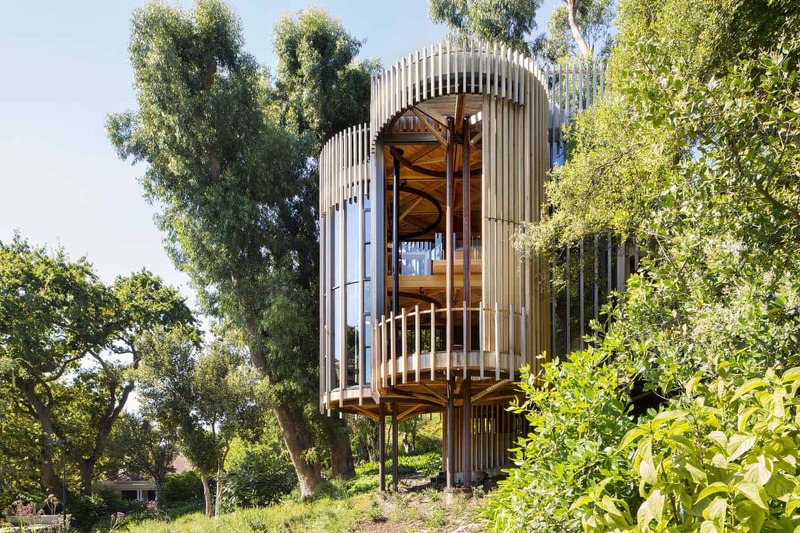 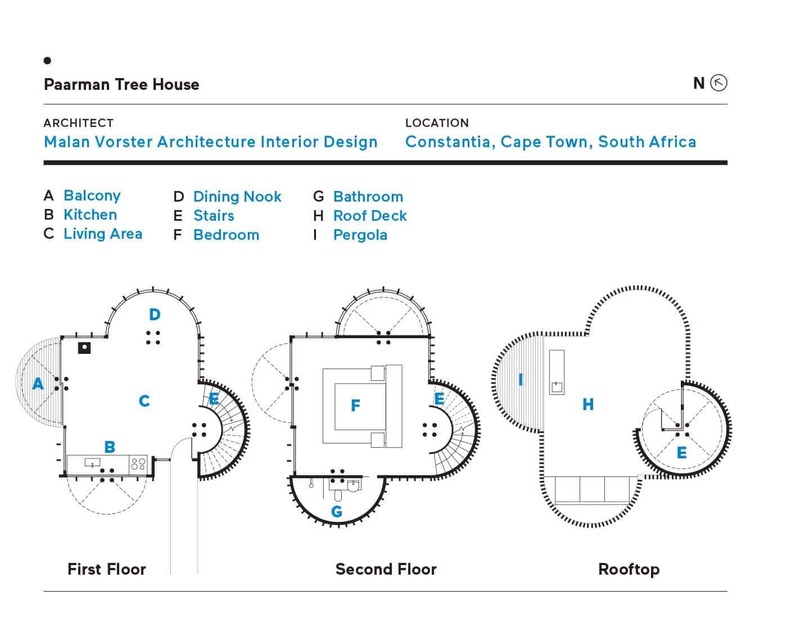 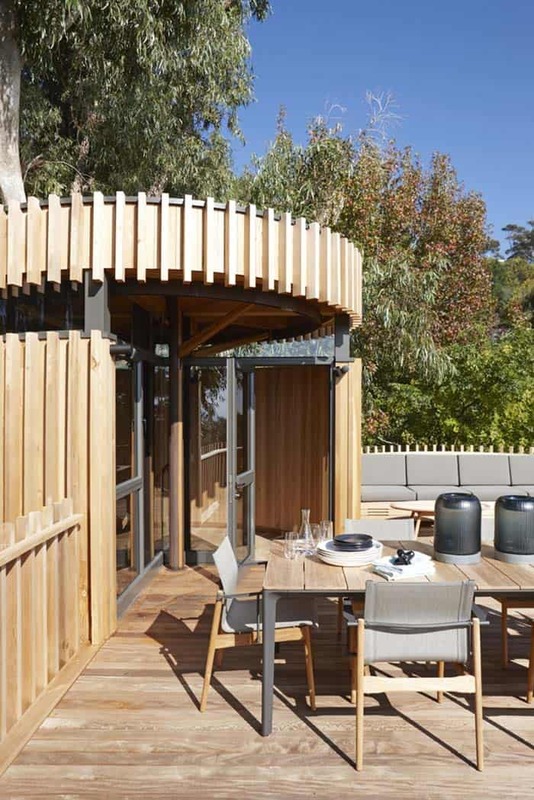 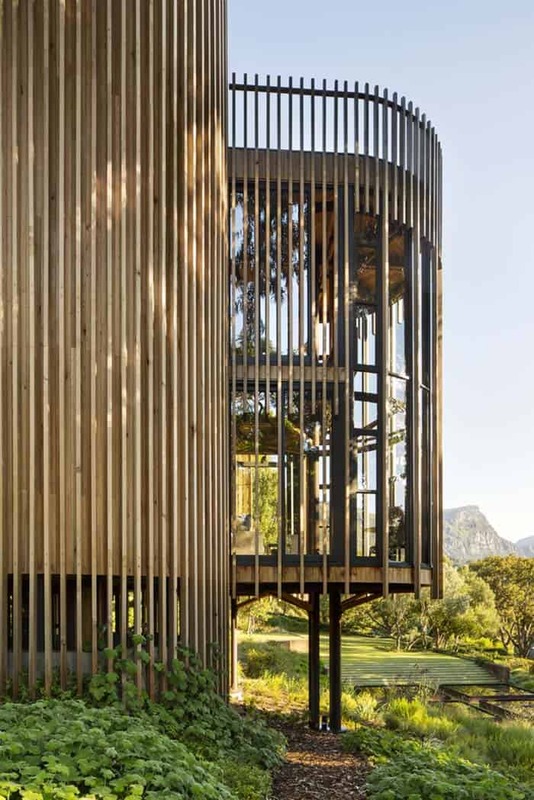 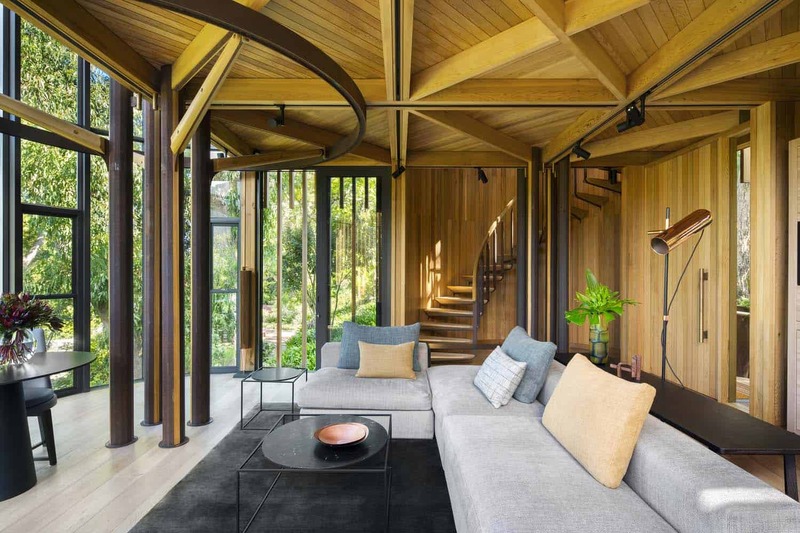 This amazing tree house design project was commissioned by interior design studio Malan Vorster, located in Constantia Valley, home of wine farms in Cape Town, South Africa. 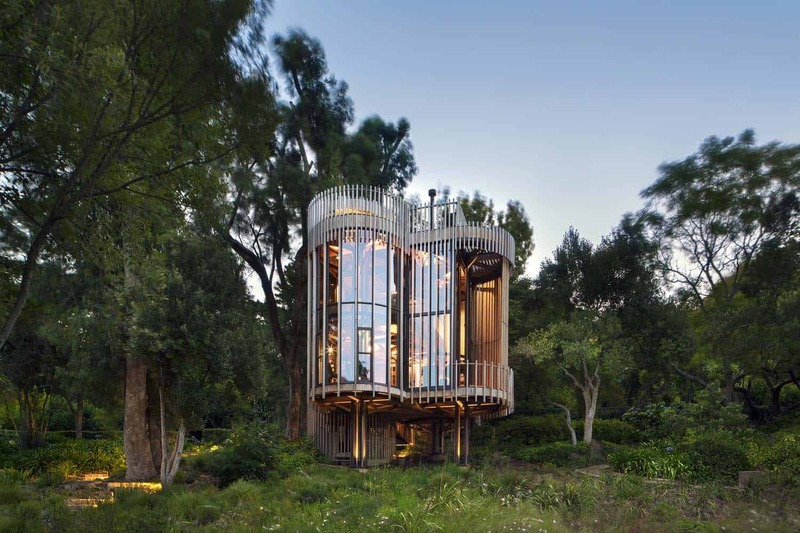 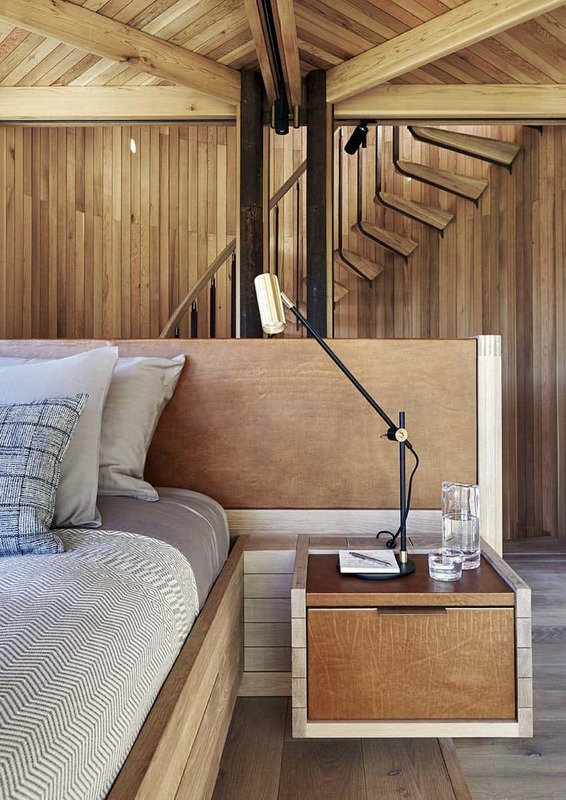 The design of this cabin-like structure was inspired by the trees on the property. 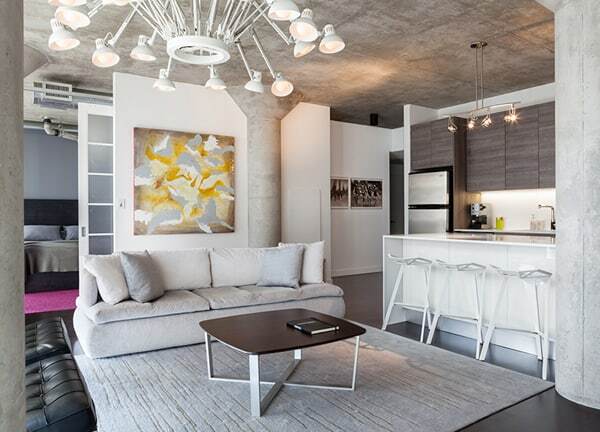 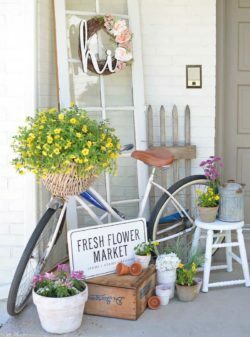 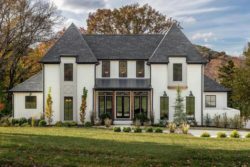 Consisting of just 1,259 square feet, this small living space features three levels—a great room with a living, kitchen and dining nook on the first level and a master bedroom suite on the second and a rooftop terrace on the third. 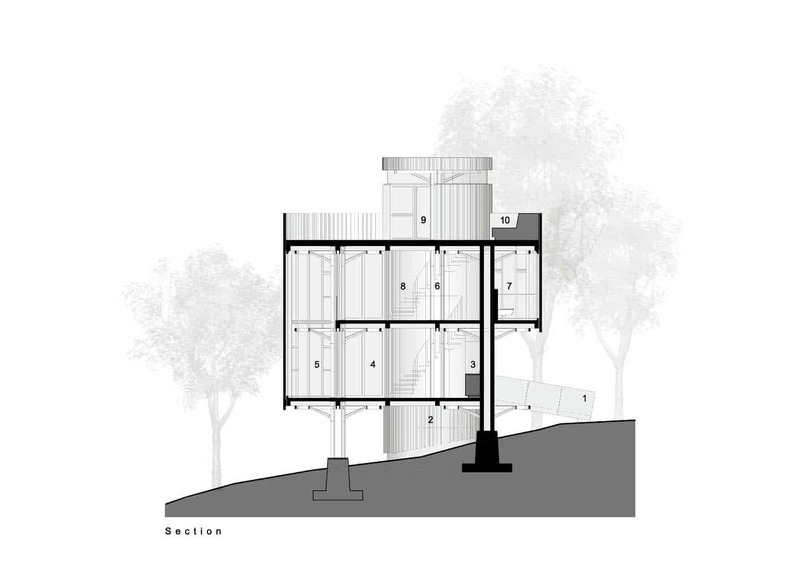 On the ground level, below the structure, is a plant room. 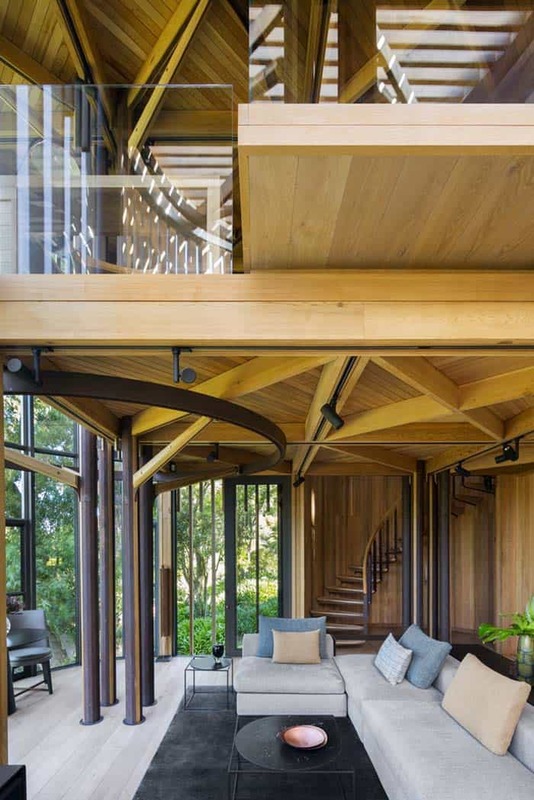 A cozy rooftop deck with built-in seating around the perimeter offers sweeping views over the lush, forest-like gardens. 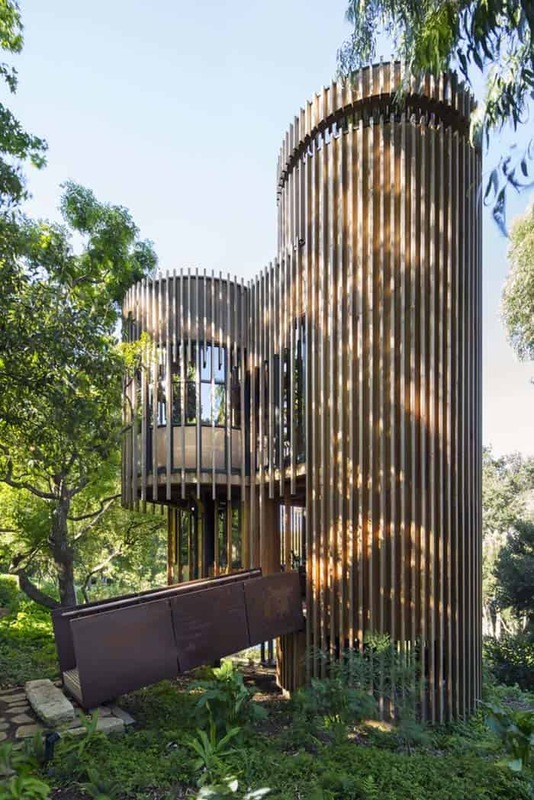 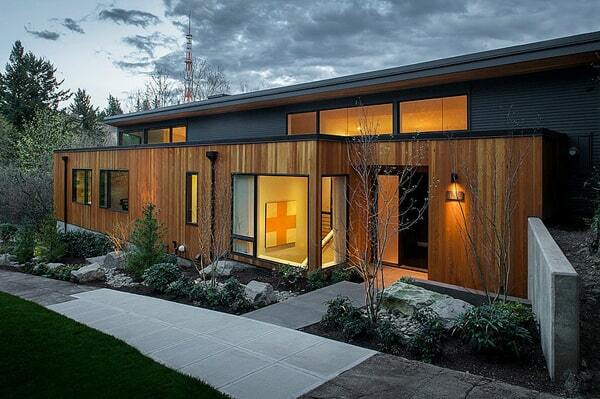 The exterior facade of the structure consists of Corten steel, western red cedar and glass. 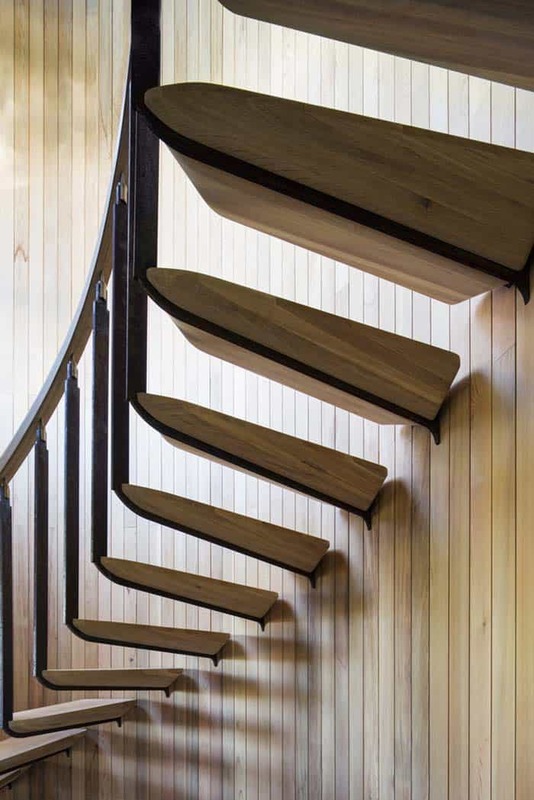 These materials are repeated on the interior, with the inclusion of Duoplank, engineered wood flooring sourced from Netherland-based manufacturer, Hakwood. 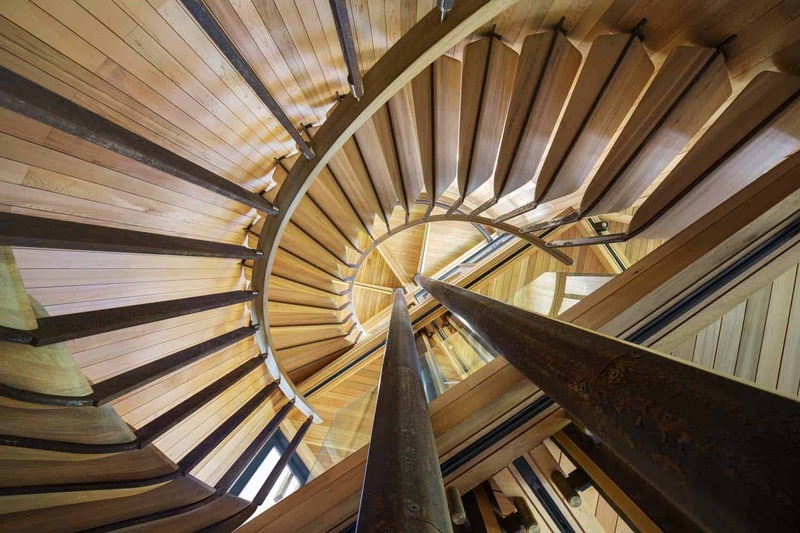 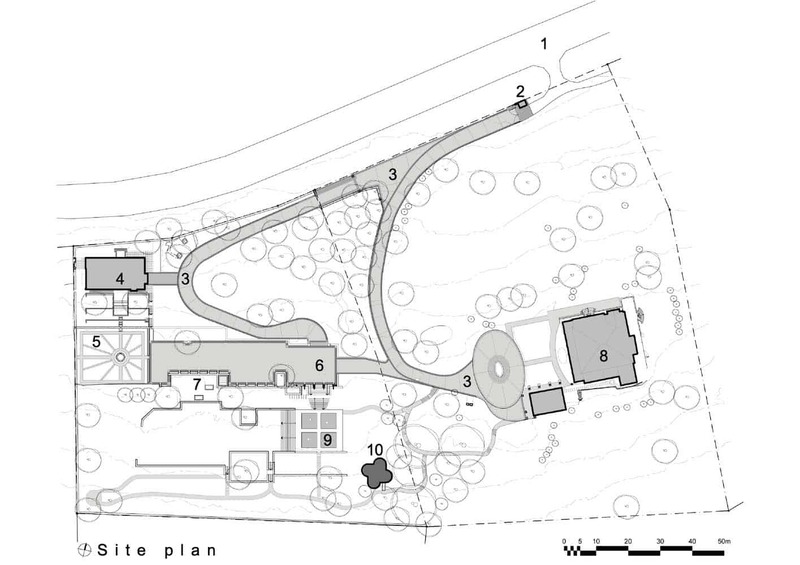 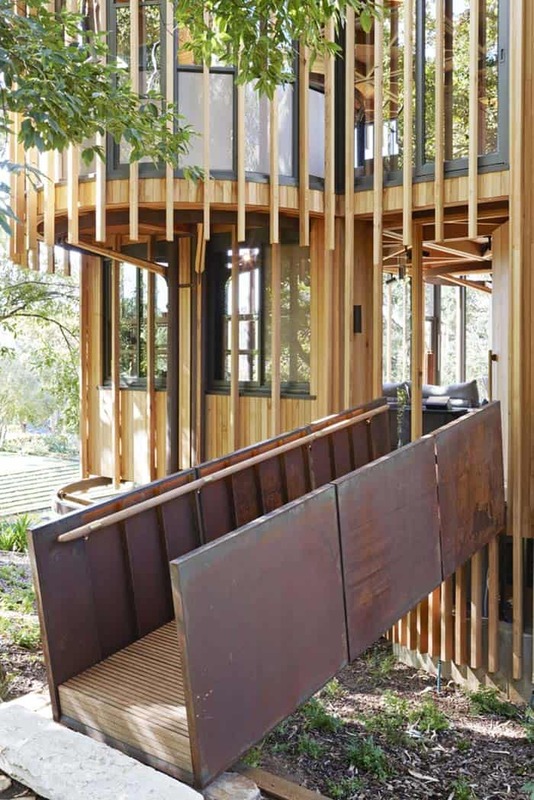 Entryway into the tree house is by means of a suspended timber and Corten steel ramp. 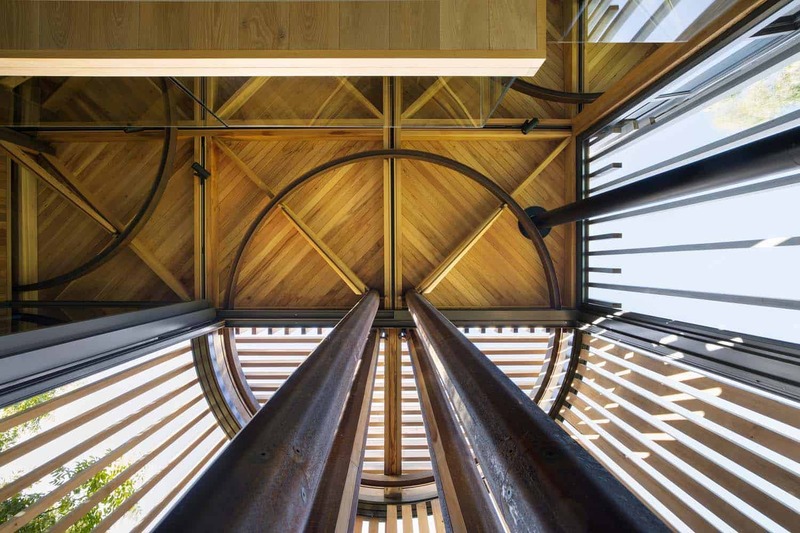 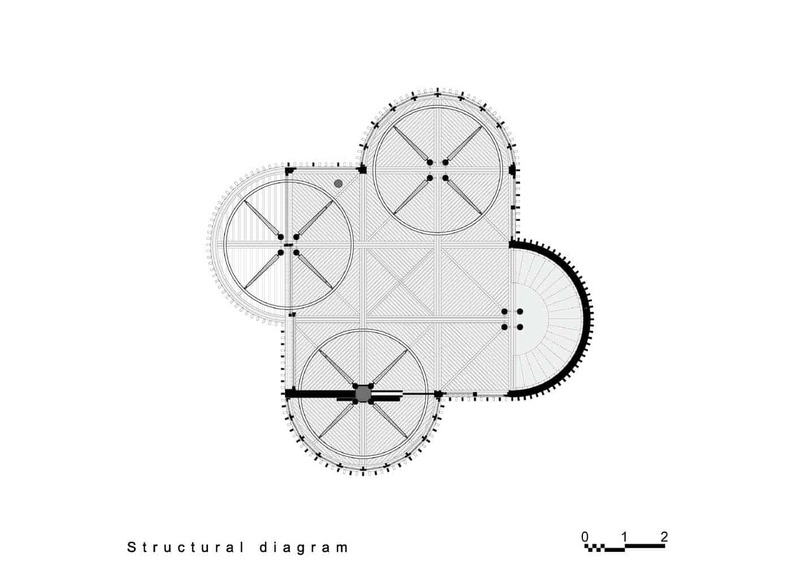 “The columns, arms and rings were constructed from laser-cut and folded Corten steel plate, while each column is divided into four ‘trunks’ in the interest of transparency, slenderness and to allow floor beams and windows to pass through the center points of the rings,” explains the architects. 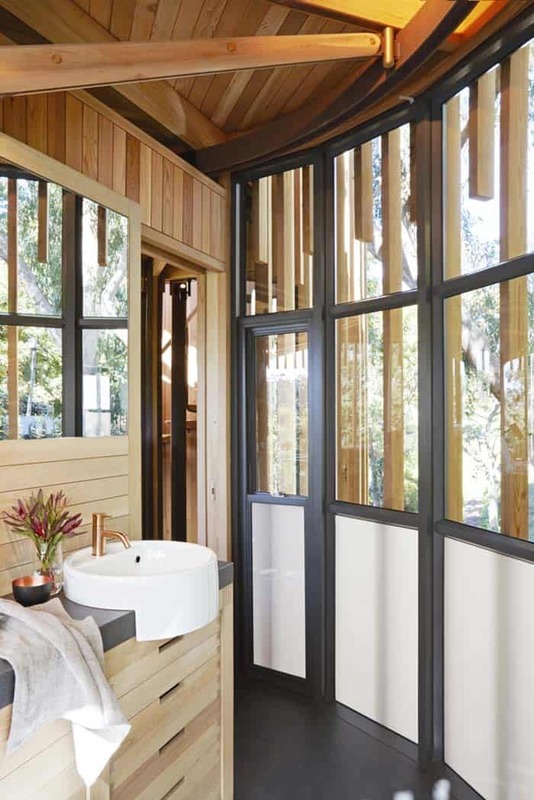 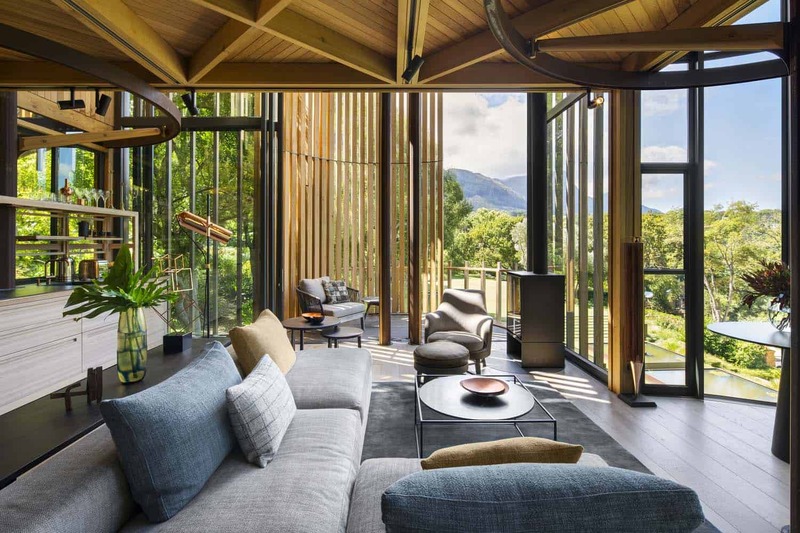 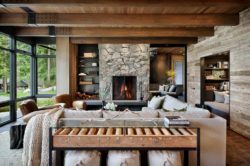 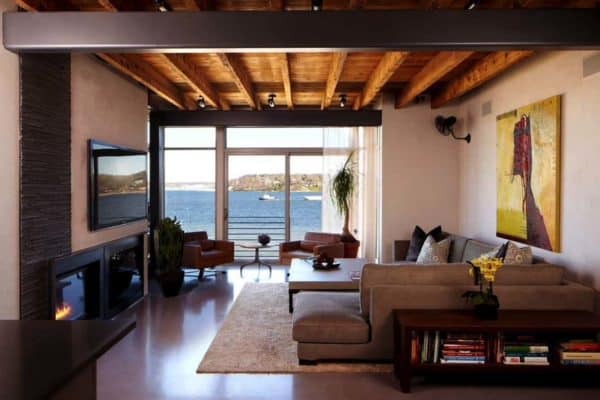 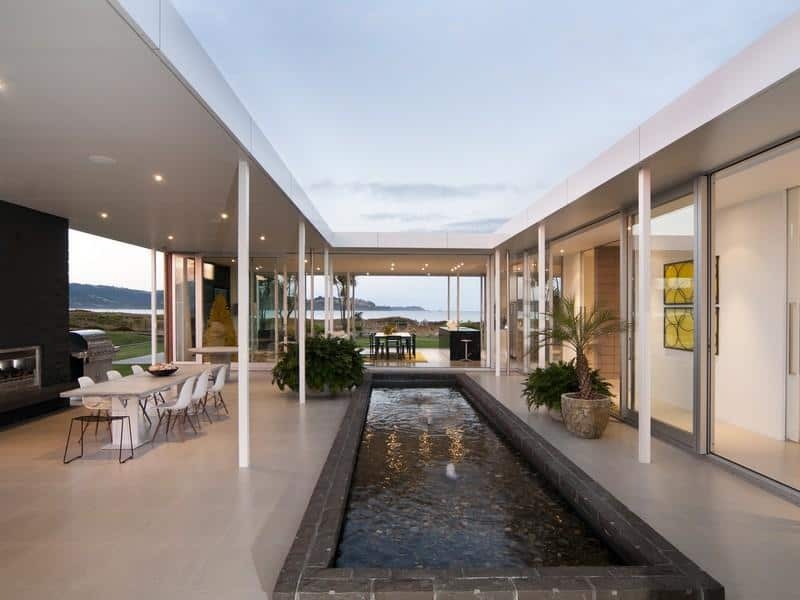 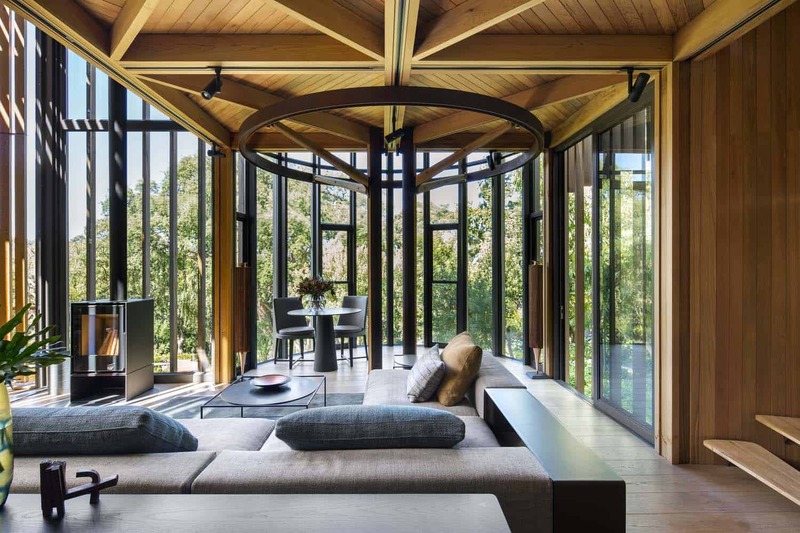 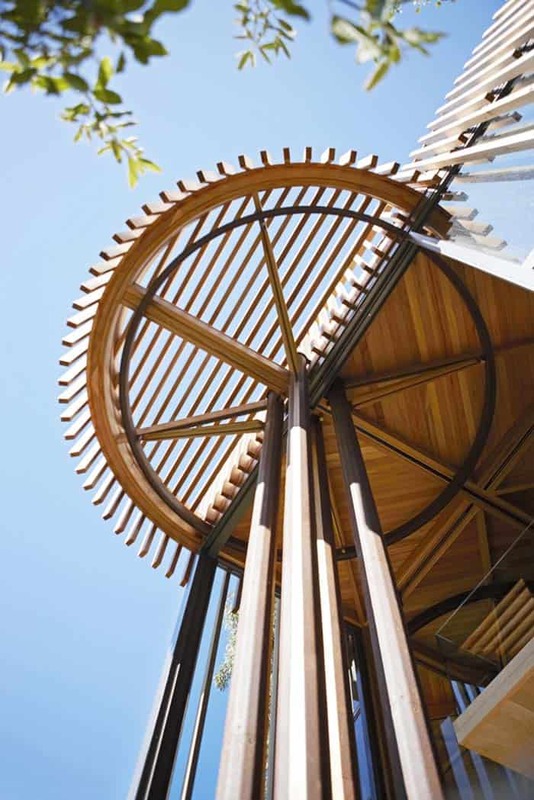 “The steel trees support timber floors beams, facade glazing and a western red cedar building envelope.” The materials used throughout the home were left untreated with the intention that they will weather naturally over time, thus blending with the surrounding trees. 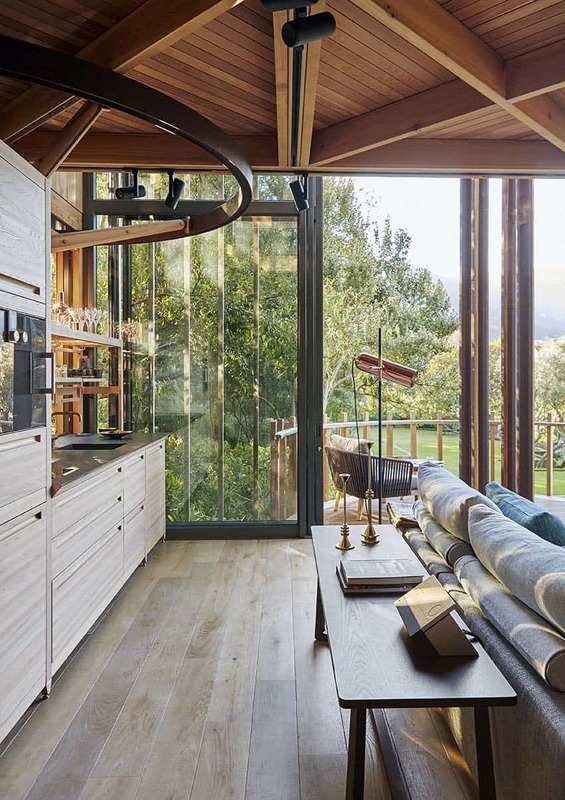 What We Love: This tree house hideaway is surrounded by gorgeous forest-like gardens and heavenly views of the distant valleys and mountains. 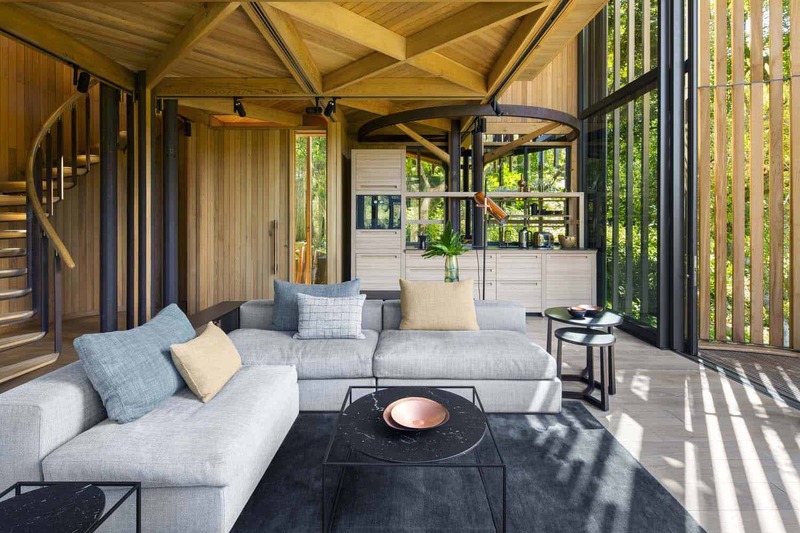 This setting is a tranquil oasis, an idyllic spot to construct a retreat away from the realities of modern life. 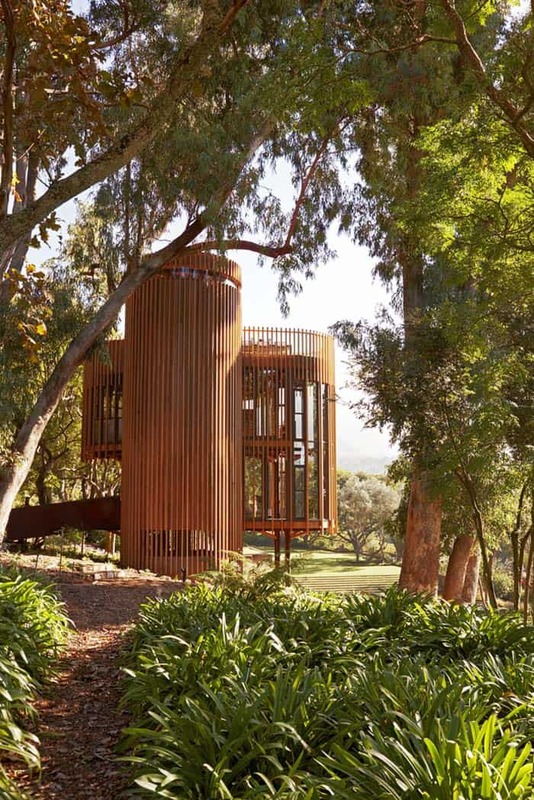 We love the idea of living amongst the trees, a small, yet comfortable getaway to relax and feel inspired… this would make the perfect writer’s retreat!